Twelve of the 18 candidates in Haiti's presidential election have called for Sunday's vote to be cancelled. The candidates, including opposition frontrunner Mirlande Manigat, said the polls were fraudulent and favoured the ruling party contender. Thousands of people marched in Port-au-Prince, demanding that the poll be scrapped, while the UN mission in Haiti expressed its "deep concern". Haiti's election body validated the vote in all but 56 polling stations. The government is reported to have insisted there will be no annulment. At least two people died on Sunday in clashes over the election, news agencies reported. The election was characterised by mismanagement and incidents of fraud, says the BBC's Mark Doyle in Haiti. There were multiple reports of would-be voters turning up at polling stations to find they were not registered to vote - and of others having the right papers but no idea where to vote. In the days approaching these elections the focus was on disasters. The massive earthquake nearly a year ago in January made two million people homeless and destroyed almost all government ministries. And the current cholera epidemic here is still raging out of control. But on election day, power politics dominated. The elections here were so poorly organised that they looked like a deliberate attempt to deny people a right to vote. I met dozens of voters whose names were not on the voting lists. I saw election officials being arrested - and saved from being lynched - after they had allegedly stuffed ballot boxes with votes for the ruling party. The opposition leaders immediately called foul. But the Haitian government looks like it will try to ride it out the protests. Some polling stations opened hours late, there were allegations that some people were voting multiple times, and thugs ransacked some polling stations. On Sunday, the 12 candidates met at a Port-au-Prince hotel to endorse a joint statement, calling on their supporters to show their anger with demonstrations against the government and the country's Provisional Electoral Council (CEP). "It is clear that the government of [President] Rene Preval, in agreement with the CEP, is putting into execution the plan hatched to tamper with the elections... with the help of the official political party and its candidate, Jude Celestin," the statement said. 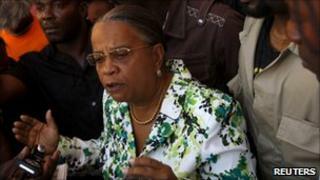 Mrs Manigat said ballot boxes had been stuffed with votes even before polls opened. The UN mission in Haiti said it "and the international community expressed their deep concern at the numerous incidents that marred the elections". However, Edmond Mulet, the Guatemalan diplomat who heads the mission, earlier said the election was going "well" - a statement considered bizarre if not absurd, our correspondent says. The CEP earlier said there had only been irregularities at 56 of the country's 1,500 polling stations, making clear the ballot would stand. CEP head Gaillot Dorsainvil said the vote was "successful", the AFP news agency reports. Poll monitors including representatives of the Caribbean regional block Caricom and others from the Organisation of American States (OAS) have yet to comment. But Mark Weisbrot, co-director of the Center for Economic and Policy Research (CEPR) which sent observers to the election, called for the results to be scrapped. "From the banning of the country's most popular party from the ballot to election day irregularities including numerous reports of ballot stuffing and the disenfranchisement of numerous eligible voters, these elections were an obvious farce from start to finish," Mr Weisbrot said. Fanmi Lavalas, the party of deposed President Jean-Bertrand Aristide, was barred from standing allegedly due to technical errors in its application forms. The polls - which closed at 2100 GMT on Sunday - were the first since a devastating earthquake struck in January, killing 230,000 people. Some 11,000 United Nations peacekeepers are helping provide security and logistical support to the process in a country where infrastructure is poor and many earthquake victims still live in tented camps, mostly in the capital, Port-au-Prince. Occasional violence had broken out during a generally peaceful campaign period. Results are due to come in from 5 December onwards, with the final tally to be announced on 20 December. If as expected no candidate receives more than 50% of the vote, the two frontrunners will proceed to a 16 January run-off. As well as a new president, Haitians are supposed to elect 11 of the country's 30 senators and all 99 parliamentary deputies.